He ties himself naked to a rocking chair and waits until he stands still. Murphy has found his ideal state of being: complete stasis, which can only be achieved with preceding motion. Only in this way can Murphy, the protagonist in Samuel Beckett’s novel of the same name from 1938, pursue his favorite activity – separating the body and mind. We find ourselves in pre-war London, to which Irishman Murphy has fled to get away from a lover in Dublin. A lot happens in Beckett’s novel, but the incidents unfold somewhat like a succession of side plots by way of explaining of the main plot – which then fails to materialize. Readers are left to link up loose ends and threads of the story for themselves to create a whole. Murphy, however, seeks to avoid all the actions: He escapes from one woman, gets engaged to prostitute Celia, whom he ultimately doesn’t desire either, and reluctantly finds a job as a ward in a psychiatric clinic, where he plays chess and envies the patients with their windowless padded cells. Ultimately, Murphy dies after a gas explosion in his own apartment. Absurdity is always at the forefront of Beckett’s novel. The author describes Murphy’s fiancée, for example, using a detailed table, which not only includes her physical measurements, but also rates which characteristics are important: “Age. Unimportant; Head. Small and Round. Eyes: Green (…) Hips, etc. 35’’; Instep. Unimportant.” There is no further explanation of this description offered, but it could represent an insight into Murphy’s way of thinking, which is in contrast to Celia’s passionate love for her fiancé. At another point, there is a detailed list of the individual moves in a bizarre game of chess that Murphy plays with Mr. Endon, a patient in the psychiatric clinic. Anyone who is familiar with the works of Samuel Beckett will know that waiting for an explanation is like, well, waiting for Godot. Hence, the picture that Beckett paints when Murphy ties himself to the rocking chair could be viewed as setting the tone for the whole novel: existence as an immediate experience. Or, as a friend of Murphy puts it in the first few pages of the novel: “Murphy, all life is figure and ground.” Thus, in return, Beckett simply reveals to us the absurdity of our own lives, our efforts, our “meaning”. This excessive refusal to subject oneself to the necessities of life and to adapt to everyday human existence seems to be something the artist Bruno Gironcoli identified with only too well. 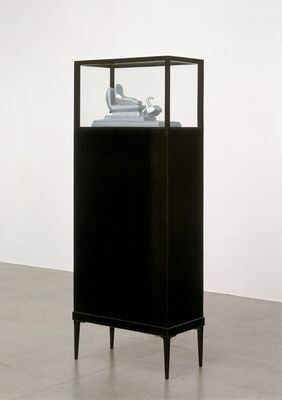 Precisely 30 years after the appearance of Beckett’s “Murphy”, Gironcoli created his sculpture “Modell in Vitrine. Entwurf für eine Figur” (“Model in Showcase. First Version of a Figure”). He calls the figure “Murphy”, thus setting a precedent for one the most crucial models in his later works, where the figure crops up over and over again. By Gironcoli’s own admission, the Murphy model came from his experimentation with plaster: “I started it by filling two rectangular sponge forms from the kitchen with plaster.” The result was a sculpture that was actually reminiscent of a human body simply because of its proportions. 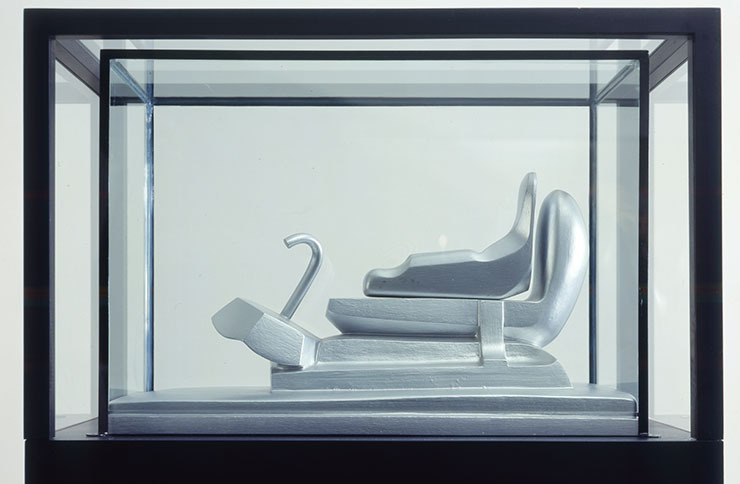 In tubular form, the reduced body lies on a kind of seat, enclosed by the glass showcase, classically enthroned on a plinth. Gironcoli explains his fascination for Beckett’s protagonist with the complete reduction of human life to one figure: “Since here someone, this Murphy, was trying to limit his areas to such an extent that it appeared to be oriented towards an inane – not towards a nothingness – but a inane life.” Murphy therefore appears like a kind of principle, one that then reemerges as a detail in his monumental sculptures. At the same time, Gironcoli was not the only artist to incorporates the figures or images of Samuel Beckett into his works. The same year in which Gironcoli’s “Murphy” appeared for the first time, American artist Bruce Nauman also created his “Slow Angle Walk (Beckett Walk)” . The performance forms the start of a series of motion-based works in which Nauman performs and examines everyday movements such as walking, jumping or playing with a ball. The “Beckett Walk” is exhibited as a video installation, which shows Nauman repeating a series of walking exercises for a duration of an hour. He crosses the room (his studio), for example, with his hands tied behind his back, throwing one of his legs up at a right-angle, rotating his body 45 degrees and then suddenly falling back, slamming his foot on the ground and lifting the other leg behind him, whereby his body leans forward like a pendulum. He pursues several sequences of this kind, with the movements carried out with such focus and confidence that the result is as compelling as it is absurd. Every step of progress appears to be an exhausting, complicated process. Since here someone, this Murphy, was trying to limit his areas to such an extent that it appeared to be oriented towards an inane [...] life. The otherwise banal everyday movements of walking or sitting on a rocking chair are thus suddenly given a stage of their own. The endless repetitions and movements of the body fill the room. For Nauman and Gironcoli, the Beckett reference acts as a kind of principle or rule: The automatic and incidental, which is so quickly lost in habit, becomes the absurd main action – reduced to merely figure and ground. Samuel Simon, ensemble member at Schauspiel Frankfurt, interprets Beckett’s Murphy.